These were just some of the questions asked and answered last week during the #MITSloanExperts “Shaping the Future of Work” Twitter chat, featuring MIT Sloan’s Thomas Kochan and hosted by former New York Times reporter Steven Greenhouse. Over the course of an hour, Kochan answered a host of questions pertaining to the future of work and the issues we face as a society as technology advances. More than 100 users chimed in with questions and comments on topics from how the divisive 2016 election is impacting how we work, to generational differences in how work is approached and viewed. If you missed it, don’t worry – this Storify summarizes everything that was discussed. Stay tuned to the #MITSloanExperts hashtags for future Twitter chats with our roster of experts and guest hosts. Professor Thomas Kochan, author of Shaping the Future of Work: A Handbook for Action and a New Social Contract, will discuss his new book that provides strategies for a new social contract to promote fair financial returns and good jobs for all, during a #MITSloanExperts Twitter chat on September 20th at 1 p.m. EDT. 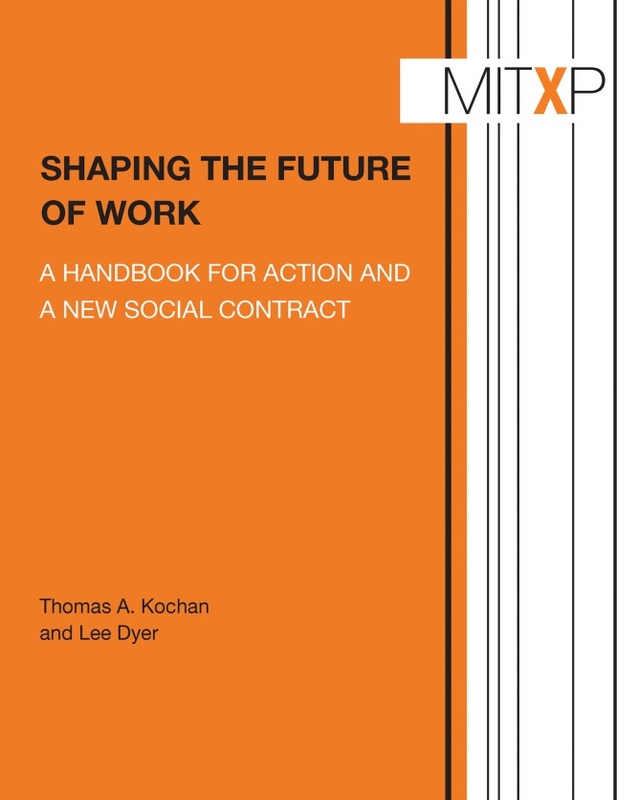 Kochan, a longtime professor at MIT Sloan, will discuss his research and that of his co-author, Lee Dyer, Emeritus Professor of Human Resources at Cornell University’s ILR School, about the ways in which business, labor, education and government can create a viable social contract. The host of the chat will be Steven Greenhouse, former labor reporter for the New York Times and author of The Big Squeeze: Tough Times for the American Worker. Thomas Kochan is the George Maverick Bunker Professor of Management, a Professor of Work and Employment Research, and the Co-Director of the MIT Sloan Institute for Work and Employment Research at the MIT Sloan School of Management. He holds a BBA in personnel management as well as an MS and a Ph.D. in industrial relations from the University of Wisconsin. Join us on Twitter on September 20 at 1 p.m. EDT and follow along using #MITSloanExperts, and potentially win a free copy of Kochan’s book. Understanding which papers attract critical citations, and what effect they have, gives an insight into how science progresses, says Christian Catalini. Science advances through researchers sharing their work for others to extend or improve. As Isaac Newton once said, he could see further by “standing on the shoulders of giants”. But what happens when those shoulders aren’t as sturdy as we thought? Sometimes, citations are negative, pointing out a study’s flaws or even disproving its findings. What role, relevance and impact do these negative citations have on a field as a whole? There has been little research in this area, because of the difficulty in identifying and classifying such citations. Thanks to advancements in the ability of computers to understand human language, known as natural-language processing, and in the ability to sort and analyse large bodies of text, this is changing. We can now identify such citations and reconstruct the context in which they were made to understand the author’s intentions better. Using such techniques, my colleagues and I have found evidence to suggest that negative citations play an important role in the advancement of science. The development of autonomous vehicles promises a future of safe and efficient roads, unimpeded by distracted, impaired, aggressive, or deliberately speeding drivers. But to achieve this, the companies involved in developing driverless cars will have to navigate significant obstacles. The transition from personally controlled to automated vehicles can be likened to the shift that occurred over the past 20 years from brick-and-mortar retail to e-commerce. For traditional storeowners, security depended on door locks, alarm systems, cameras, and access to cash registers. For online retailers, security has to do with networks and software. Similarly, the safety focus in driverless vehicles will be largely about securing the networks and software that drive the cars. Today’s cars have approximately 100 million lines of code in them. Autonomous cars will have many times more. The companies that manufacture driverless cars will have to actively manage all of the security aspects of the vehicles’ software. Today’s carmakers have, over time, developed efficient procedures for recalling and fixing vehicles with parts identified as faulty or unsafe. Similarly, with autonomous vehicles, manufacturers will need to devise methods of identifying and fixing problems discovered in software. In many cases, repairs can be done remotely, in the same way that mobile phone and computer makers can send patches over networks. But however fixes are made, management of software supply chains will need to be as efficient as the management of the supply chains for physical parts. As humans, we crave contact with one another. From tiny newborn babies who need their mothers, to the elderly who long for their children, throughout all stages of our lives, we reach for each other. It’s always been this way. Technology can’t replace the very thing that makes us human. Many years ago, I was left to care for my dad, who had early-stage Alzheimer’s. One of the first things I had to do was take away his car, as his driving had become dangerous. This was difficult. My Dad was a “car guy,” and he had taught me everything I know about cars — it was a love we shared together. Taking away his car left him incredibly isolated; he would try to call his friends during the day, only to be confused by answering machines that sounded like humans. Sometimes, Dad would even call companies who sent him bills, claiming he had questions, but really, I think he just wanted to reach out to another person. Again, he was foiled by the machines who told him to press 1 for this, and press 2 for that, always finding ways to keep him from connecting with an actual human. As a response to this, I started GetHuman, a website that allows customers to call real people at big companies without having to wait on the line or go through a million robots. Today, GetHuman.com receives millions of visitors a month, helping people with customer service issues at places like Verizon and Comcast.